Jessabella Reads: Blog Tour: Scorched by Mari Mancusi - Review, Author Interview, and Giveaway! Blog Tour: Scorched by Mari Mancusi - Review, Author Interview, and Giveaway! Welcome to my stop on the Scorched blog tour presented by Sourcebooks! 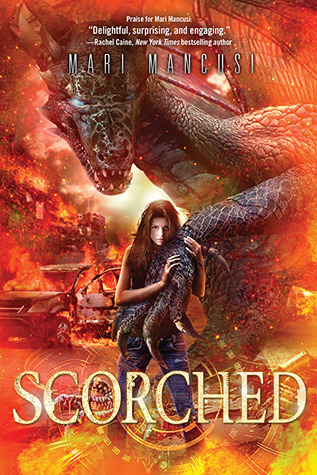 Today I have an interview with the amazing Mari Mancusi, along with my review of Scorched, and a giveaway! Feel free to leave any questions or comments you may have for Mari, as she will be stopping by today (9/11/13) to answer them/comment back! He’s come from a future scorched by dragonfire. His mission: Find the girl. Destroy the egg. Save the world. He’s everything his twin brother Connor hates: cocky, undisciplined, and obsessed with saving dragons. Trinity has no idea which brother to believe. All she has to go by is the voice in her head—a dragon that won’t be tamed. I first heard about Scorched at BEA '13. Since I have read Mari's Blood Coven Vampire series(which I loved), I was very curious to see that she had written something completely different, and I couldn't wait to dive in. Scorched was a mish-mash of fantasy, sci-fi, romance, and time travel. This could have been a recipe for disaster, but through Mari's spectacular writing and execution, an amazing story was born. The story is told through three different characters' perspectives. Trinity's chapters are written in first-person narration, which really helps to let the reader get inside her head. I feel that this was very important in order to connect with her on a deeper level. It also gave me more insight into her emotions when she begins to hear Emmy's(a dragon) voice in her head. Conner and Caleb's chapters were written in third-person narration, which gives the feeling that they are different from Trinity in a major way. Since they are from the future, and therefore not of Trinity's "world" per-se, I felt the choice was spot-on. The main characters were written beautifully, and I was emotionally invested in every single one. I felt as though I really got to know Trinity, Caleb, and Conner quite well even before they meet in the book. There were some extremely tense and emotional moments in Scorched. The pacing is fast, as many action scenes drive the plot. You will keep turning the pages with that "need" to know what will happen next. I loved how the story was broken down into five parts, each with a title perfectly fitting each part. It was fun when, after you finished a "part", you could say "Wow, THAT'S why it was called ____". There were also a few shocking revelations that I never saw coming where my mouth(and heart) literally dropped to the floor! I had a feeling I was going to enjoy this book just from reading the blurb and having read Mari's work in the past. What I didn't know was how emotionally invested I would get, until I found my heart in my throat many times while reading. Scorched is a beautifully written story of a girl caught in the middle of something she dosen't understand, but trying to stay true to herself and do the right thing. I won't say too much on this, but if you are someone who needs love/romance in your books, you will find what you need and more in this one. Overall, I feel that Mari really hit a homerun with Scorched. Even though this book is meant to be more emotional and intense(a great thing), fans of her Blood Coven Vampire series will find pieces of her engaging humor here too(an equally great thing). I would recommend this book to anyone who loves YA fantasy, sci-fi, romance, or just dragons in general! Of course if your already a fan of Mari's work, why are you not reading this right now?!?! Intense, engaging, emotional, and surprising...a must read! 1. )Welcome to Jessabella Reads, Mari! I am soo excited to have you on the blog today. I am obsessed with the world of Scorched, where did you get the inspiration for it? Thank you! I’ve always loved both sci-fi and fantasy so I thought it would be fun to mash up the two. I like to credit the movie Terminator for much of my inspiration, though instead of a robot/machine apocalypse, Scorched deals with a dragon apocalypse. I’ve always loved dragon books – from Anne McCaffrey’s Dragonriders of Pern series to Robin McKinley’s Hero and the Crown. 2.) I really connected with all of the characters in your story. Which character was your favorite to write and why? I think Caleb is my favorite to write. He’s sarcastic and sardonic, but also hiding a lot of angst. He comes off as a jerk sometimes, but he really loves Trinity and would do anything for her. 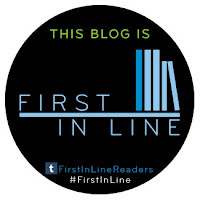 Prodigy by Marie Lu and Doll Bones by Holly Black. 4.) What are your "must-haves" when sitting down to write? Coffee and silence. I’m not one of those writers who does great writing in a café setting. I prefer a quiet office where I can read aloud what I’ve written. I also have surrounded myself with lots of dragon inspiration. From stuffed dragons to dragon portraits on the wall. 5.) If you could inhabit the body of any character in Scorched for 24 hours, which one would you choose and why? I think it’d be fun to be Trinity at the point where she gets to go into the Nether and fly on Emmy’s back. There’s just something about the idea of flying on a dragon that I know would be awesome. I just hope she can get over her fear of heights and allow me to enjoy my ride! 6.) Dragons are one of my favorite paranormal creatures. Tell us why you decided to write about them. Dragons are beautiful and majestic creatures that can bond telepathically with humans and fly through the sky. Who wouldn’t want to write about them? That said, most dragon books take place in some kind of fantasy kingdom or some distant past. I wanted to explore what it’d be like to bring them to present day Texas. Dragons trending on Twitter, anyone? 7.) What are some of your literary inspirations? Favorite books/authors? My favorite book is Mists of Avalon by Marion Zimmer Bradley. It is basically a feminist retelling of Arthurian legend and is just so enthralling and beautifully written. For a more modern author, I’m obsessed with Cassandra Clare. I love how she masterfully mixes humor with action/adventure. 8.) Personally, I will read anything you write! Any hints about what we can EAGERLY anticipate from you next? Thank you! Next up is Shattered, book 2 of the Scorched series, which will continue the adventures of Trinity, Connor, Caleb and Emmy. It takes place three months after the first book ends and it’s getting more and more difficult to hide out from the world—with Emmy getting bigger everyday! Also, if you liked Scorched, I suggest you check out Tomorrow Land and Alternity, two standalone novels I published a while back that were recently re-released. Tomorrow Land is a standalone zombie novel and Alternity is kind of Matrix-y. But they’ve both got kind of a similar feel to Scorched. Mari Mancusi used to wish she could become a vampire back in high school. But she ended up in another blood sucking profession –journalism — instead. Today she works as a freelance TV producer and author of books for teens and adults. When not writing about creatures of the night, Mari enjoys traveling, cooking, goth clubbing, watching cheesy horror movies, and her favorite guilty pleasure–videogames. A graduate of Boston University and a two time Emmy Award winner, she lives in Austin , Texas with her husband Jacob, daughter Avalon and their dog Mesquite. You can find Mari online at www.marimancusi.com orwww.bloodcovenvampires.com. OMG! This is on my to-read list! Thank you for the awesome giveaway! Your review was really good. I loved the enthusiasm you put into it. Thanks also for the generous giveaway. The cover is fantastic. I love the idea of several genres blending together like this and I've a weakness for dragon stories. It will be interesting to read a book that swaps between first and third person perspectives. Thanks for sharing about the book and the opportunity to 'meet' Mari along with the giveaway. how many books do you think the seris will count in total? I'm excited for this giveaway. I love Sci Fi and Fantasy, as well. The book sounds amazing! I'm fascinated with dragons, so a story with dragon shifters really caught my attention. I enjoyed the interview and I'm glad to read such a positive review. I can't wait to read Scorched, it sounds like a fantastic book. this book looks and sounds fantastic! Thanks for the great review! I would love this to be the first one of her books that I'll read. Thanks for the chance to own a copy! Loved the trailer and review, this book sounds wonderful and I would enjoy getting a chance to win a copy. Thanks for the giveaway. I always enjoy different POV when I read. A great post thank you. This is really cool. But I want to know what made Mari so interested in vampires? This book sounds really great. I'd love to read it. And the cover is awesome!! Dragons are my favorite. Can't wait to read this book. It would be great to win a copy of Scorched by Mari Mancusi. and your interview with Mari Mancusi was great. I enjoy reading and discovering new authors and i think i would enjoy reading this book. book looks great would love to read very soon. sounds very interesting,she is one of my favorite authors! I love the cover and this books sounds amazing!!! I haven't read anything by Mari as yet but that's definitely about to change. Scorched sounds fascinating! I've been obsessed with dragons since elementary school and wanted one of my own. Never did get one :( Can't wait to read Scorched! Sounds like a tense, action-packed book! Thanks for sharing, I would love to discover this new book. This one sounds really cool. I love dragons! Also the differing POVs sounds interesting. I'm going insane for when I can finally dig into this book. Thanks for the post! Such an original take on dragons! I really want to read this one. Love the thought of it being pov..and great take on a good story line.. definitely adding to my TBR! Great interview! Adding this book to my wishlist! wow! the book seems nice to read! awesome book review! Cool.Thanks for the interview.Just love it..the author and the book. This book sounds awesome! When I first heard about it, I wasn't sure, but after seeing all of the awesome posts and reviews from the blog tour I really want to read it! I think my hesitance was because I have never read a dragon book, but now I'm excited to try something new. And your review was really great - I really love a fast-paced, exciting, emotional YA book! Awesome Review and Interview this book looks and sounds amazing love your review makes me want to buy this one soon!